When Hayley is invited to do a cooking demo on one of daytime's most popular talk shows, it's a welcome distraction from her empty nest blues. And the newfound fame certainly has its perks - especially when Olivia Redmond, the posh bacon heiress of Redmond Meats, offers Hayley a writing gig with a juicy paycheck. But Hayley's good fortune fizzles fast. 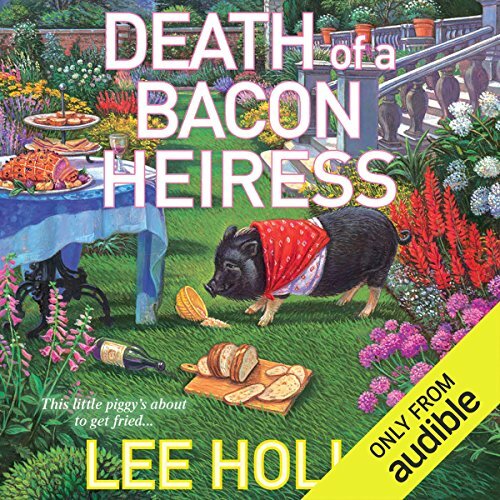 The heiress is found dead with her pet pot-bellied pig, Pork Chop, squealing bloody murder beside her body, and clogged arteries aren't to blame. It turns out Olivia's inherited a wealth of enemies over the years, and as Hayley trims the fat off a mounting list of suspects, it's clear that being rich and hot tempered can be a recipe for disaster. ©2016 Rick Copp and Holly Simason (P)2016 Audible, Inc. I rate this as a fan of the genre of cozy mysteries, not literature in general. I really like this series and the recipes are good and inspiring too. I love the fact that Audible now provides the recipes as a download, so I don't need to pause the story and write the good ones down. My judge of a good book is that the performance is entertaining does not distract from the story, the story is written and paced well and the two fit together in a way that I want to drive in the slow lane to hear more of the book before I reach my destination. This book hits all of those points. I think it's a good thing when the thing I dislike most about a book is waiting for the next one in the series. As always the mini newspaper article stories & recipes tossed in make the this series unique & enjoyable. I enjoyed it all from start to finish & hope the books keep getting better as they go along! this brother sister team just write fabulous books.everybook has stories that you get so involved with. you really feel like you know the characters, their emotions and their feelings.after you read this book look for death of a coupon clipper .you'll see it below when you do your review..same authors and if you like the coupon show or just to save with coupons, you'll enjoy the mystery.trying to solve who did it, is so much fun.enjoy both books. I absolutely love this series! Even though the plots aren't the most believable, I look forward to each new book. The characters are fun and the story keeps me guessing. Plus they include a number of great recipes along the way. I definitely recommend this book, and each in the series for a fun, light read. This is a light and fun story. It sure is good that some of the murder victims and murderers come from out of town. If they didn't the whole town would be dead or behind bars by now. Based on the 2010 census there were only 5235 people in Bar Harbor. Enough nit picking. I really did enjoy this story, even though the series gets less believable as we go along. I will definitely pickup the next book if there is one. I think I can see where the relationship side of things is going. I'm hooked and love every silly unbelievable moment of the journey.